Widely known for his work in the Smiths, Morrissey has since created a fan base of his own. A vocalist and composer, his deeply sensitive songs have caused heartache, pain, and joy in the many people that turn to him for comfort. 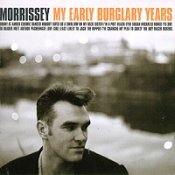 His latest offering, MY EARLY BURGLARY YEARS, offers up sixteen rare, b-side, and previously unreleased songs that span his entire solo career. Never one to shy away from a sweet, confused pop core, Morrissey brings the same level of love, angst, and solitude that has filled up his previous efforts. Full of sincere pop hooks, this album has a bite that is a lot harder than it's bark. Just the sound of his voice can bring tears to many, so full of heartache and turmoil it's hard not to want to shed a few water drops when the words begin to creep into your body via the ear canal. "Sunny" is everything but. The acoustic roar of the song cries out with a depressing overtone, offering a glimpse of hope now and then. As always, Morrissey's voice also helps convey a theme of loneliness and love gone wrong. Too much affection for a person turns bitter, all the while your still hanging on to what was once there, what was once known as truth. Then there is "Sister I'm A Poet," which has a deep bass groove to it that helps push it up towards the sky and give it a danceable melody. When the vocals enter, the bouncy bass plays on, helping to lighten up the mood and give Morrissey's words a positive, very upbeat feel to them. Helping to keep the positive vibe flowing, "Reader Meet Author" jumps through enticing drum maneuvers, fluffy guitar drives, and a solid bass kick that motors the song into an upright position. Even when the lyrics resemble depression, the song interrupts and bumps the song back into the right direction. But this upbeat feeling doesn't last forever. "Jack The Ripper" once again brings some trademark Morrissey emotions your way, helping to tone down the mood and let you sit there and ponder life and your good fortune. Not overly depressing, but honest as he knows the word, the lyrics and the music work hand-in-hand to create a shatterproof, soft world that will hold you captive for the remainder of the song. Ending with "Boxers," the disc ends half way between the upbeat and the slower stuff that you'll find on this disc. A great closure to an album that has so many aspects to it. One thing you can always say about Morrissey that will always stand true, he makes you feel something. Whether you like it or not, you're emotions will turn on the minute his voice flies through the speakers. I'll give this disc a B+.